Unimak Trader is grounded with over a million pounds of frozen seafood on board, as seen from an Air Station Kodiak Hercules airplane. Usually when the Coast Guard is involved, lives are on the line. However, in this case, it’s 1.4 million pounds of frozen seafood at risk. 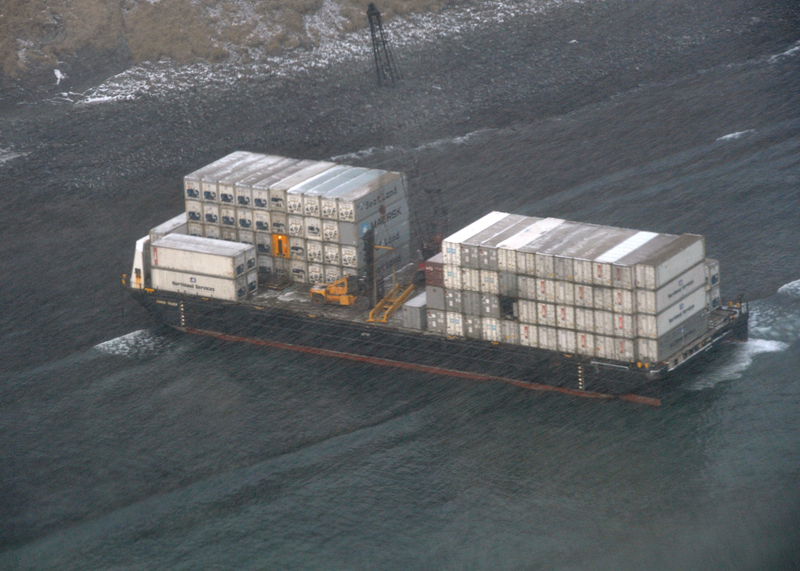 The tug Polar Wind and barge Unimak Trader ran aground near Dutch Harbor in Alaska on Nov. 13, The Dutch-Harbor Fisherman reported. The Coast Guard rescued five crew members; none were injured. Now, over a week later, the Coast Guard is beginning to plug leaks and trying to save over 1,475,000 pounds of frozen seafood in 30 operational refrigeration containers. Generators on board are still functional and keeping the containers cool, the newspaper reported. A light oil sheen was also seen in the area, but it is now controlled with a containment boom. No wildlife has been affected. Isn’t the Polar Wind a large ice breaker, rather than a tug?